iSpy can connect to virtually any audio source. To add a microphone into iSpy click on "Add" and click "Microphone" or right click the iSpy Surface and click "Add Microphone". You will be taken to one of the following screens to configure the connection. You can change the tab selection if you change your mind about the type of microphone you want to add. 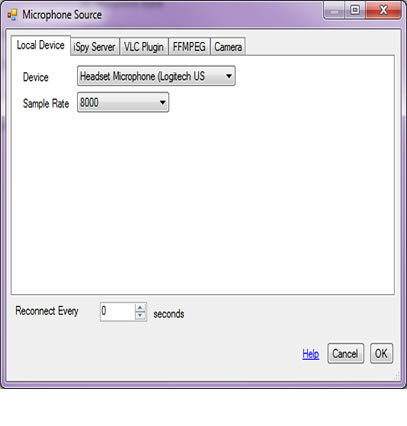 You can add any USB microphone to iSpy - most webcams these days have microphones built in which iSpy can usually detect and attach to as well. To select a USB microphone just select one from the list of available devices listed on this tab. Many IP cameras have audio capabilities as well as video. Certain types of streams from webcams (like ASF streams) provide audio. iSpy can connect to, monitor and record the audio from these devices. 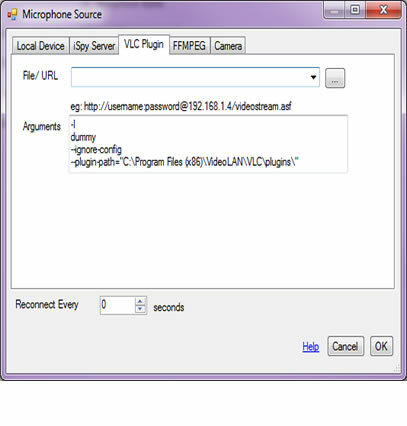 To connect to an audio stream via VLC you enter the URL to the stream just as you would for a camera. 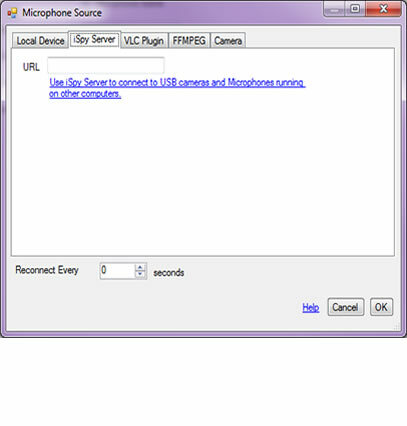 To connect to USB microphones running on another computer you need to install iSpyServer on that computer and then add the USB microphone to iSpyServer. Under the microphone in iSpyServer you'll see a link that reads (example): http://192.168.1.8:257/ Copy this address down and come back to your computer running iSpy. Add an iSpyServer microphone (as shown) and paste the address into the URL field. Click OK. You should now be able to access your remote USB microphone feed over the network.